Brunei, which in the sixteenth century had controlled most of Borneo and neighbouring islands, had shrunk to its present borders by the middle of the nineteenth century. Britain’s formal relationship with Brunei started in 1846-7 with two Treaties, of Friendship and of Commerce. In 1855, Spenser St John, who had been both secretary and deputy to Sir James Brooke, raja of Sarawak, was appointed consul-general in Borneo and destined to spend a good part of each year in Brunei. He therefore asked the Sultan to allot a site for a consulate. It is unclear whether the Sultan or St John chose the site but it was selected with great skill on a wooded slope above the east bank of the river as it turned into the town of Bandar Seri Begawan. Here St John built a ‘temporary leaf house’ when he took up residence in Brunei in 1856 and lived in that while he sought to persuade the Treasury to pay for a proper consulate building. He proposed that it should be of brick because ‘it is a favourable practice among the Borneans to burn out those to whom they take a dislike’ and estimated that £1,000 would be sufficient. The Treasury agreed to the building at public expense in return for an annual deduction from his salary of 4% of its cost. The building was ready in 1858 and the final cost was more like £1,800. No plans have been found but it was evidently not a small building. St John described it as ‘a two storied brick house of above eighty feet square, built in a strong wooden frame’ and a surveyor as being ‘erected on a framework of timber resting in some places on solid sandstone, in others on made ground’, in all about thirty feet high, with a tiled roof. The house was continuously lived in for only three years. When St John was posted to Haiti in 1861, consular duties in Brunei were transferred to successive governors of Labuan, only some of whom stayed at the deteriorating house when they visited, and in 1876 the Foreign Office accepted that the house should be abandoned. Meanwhile, St John’s Malay writer, Inche Mahomed, had been appointed consular agent and was granted land, on which he built a house at the river’s edge, next to the consulate site. He died there in 1890, but the official part of his house continued to be used as the consulate. In 1903, Sir Frank Swettenham, governor of the Straits Settlements, persuaded the Foreign Office to send an able British officer to Brunei as acting consul to make recommendations to remedy an unsatisfactory political state of affairs in the Sultanate. 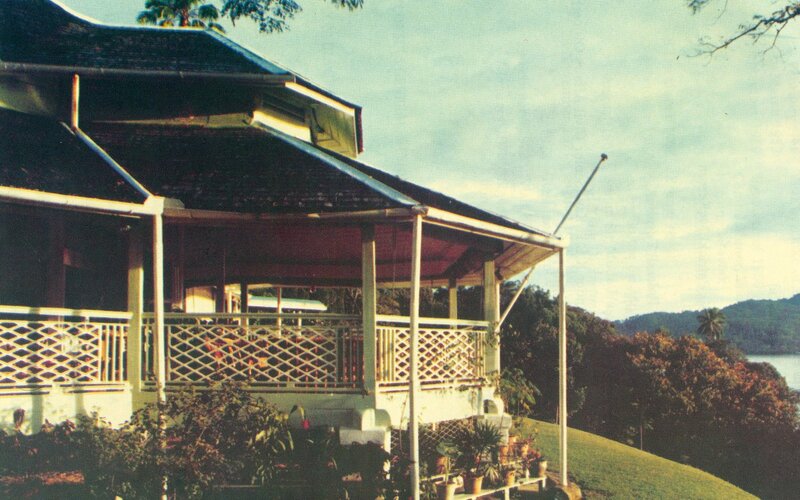 Stanley McArthur accordingly arrived in Brunei in 1904 and stayed for six months: he worked from the official part of Mahomed’s, by now very rickety, house, and mentioned in his report that the ruins of St John’s house could still be traced on the hill nearby. He thought it still an excellent site for a European dwelling. 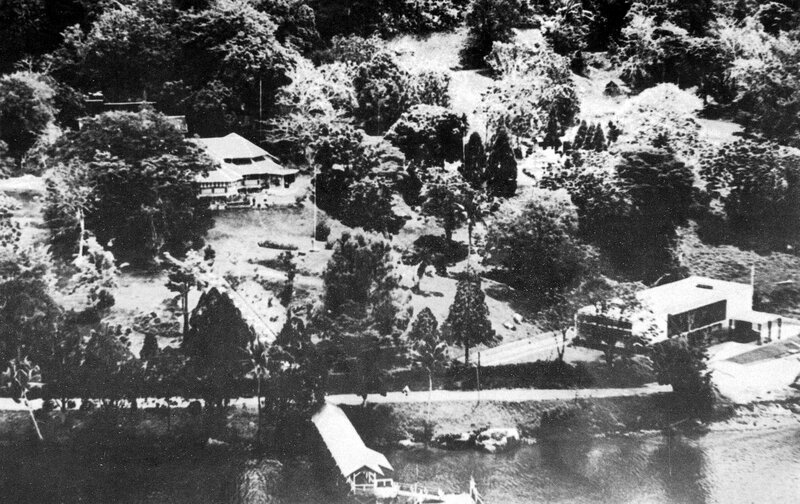 The bungalow was completed in July 1907. It was timber-framed on low brick piers, and had an unusual plan, well adapted to its site and views. It had a necessarily complicated arrangement of pitched roofs – hence its local name ‘the House of Twelve Roofs’ (Bubongan Dua-Belas), with its shallow shingle slopes reflecting the curve of the hill and the river below. The main part of the veranda that jutted forward commanded wide views of the town to the north, across the river to the west and down it to the south. The architect is unknown, and no plans earlier than 1948 have been found, but E Roberts, formerly local manager of the Island Trading Company and, from 1906, Superintendent of Works and Surveys in the new administration of Brunei, is perhaps the most likely designer. No builder is known either, but it could well have been the staff and labour of the Public Works Department. 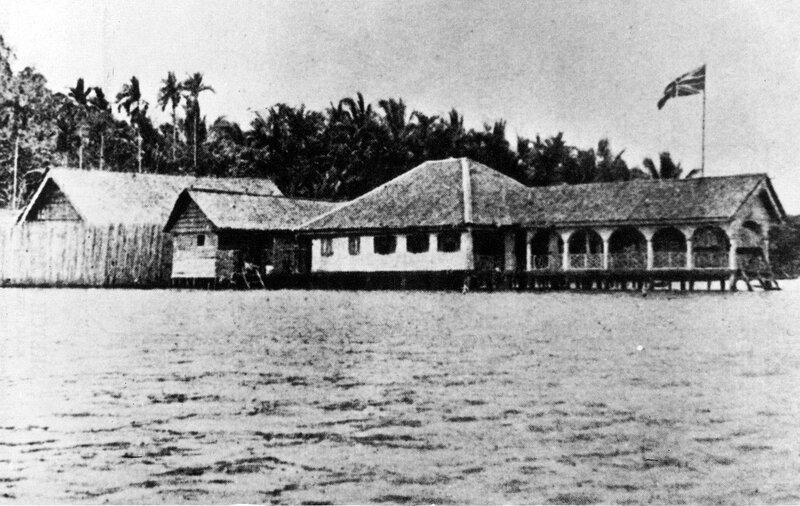 The house was paid for out of a large loan from the Federated Malay States, and itemised in their accounts in 1916 as costing $8,000. The police moved off the site and into the town in 1920; there was some damage from a lightning strike in 1924; the residency was used by the Japanese as their headquarters 1941-45; new offices were built near the house in 1952, and again in 1960; and in 1953 the central reception room was removed so that the already large veranda could reach back deep into the heart of the house to create a really splendid entertainment space. Brunei attained self-government in 1959 but with Britain retaining responsibility for foreign affairs. At the same time, Brunei separated from Sarawak and the governor of Sarawak’s title of high commissioner devolved upon the former resident in Brunei, who continued to live in the residence. Another treaty in 1979, that came into force in 1984, granted Brunei full independence and sovereignty, and brought to an end the high commissioner’s use of the residence. It is now [?still] a museum and exhibition centre, opened by HM The Queen in 1998. 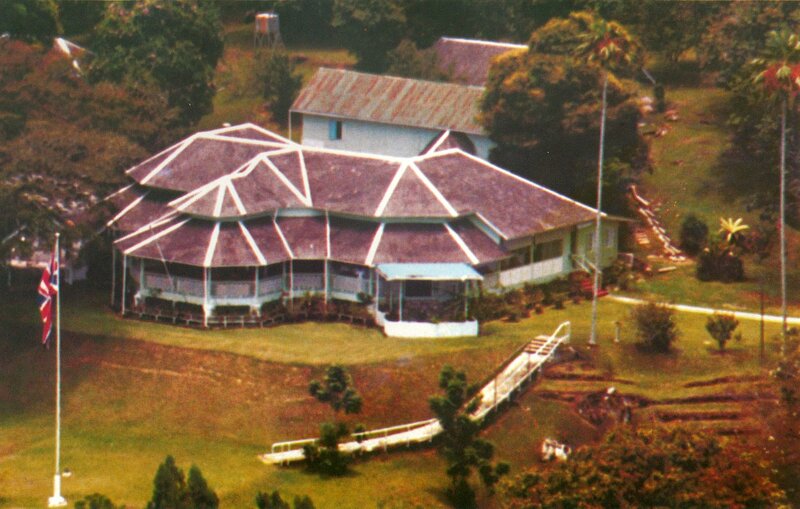 I have drawn on the comprehensive Notes on the history of Bubongan Dua-Belas, the British High Commissioner’s Residence in Brunei by Arthur C Watson (high commissioner 1978-83), published by the Brunei Museum Journal, 1981. I also acknowledge that the photographs on this page are taken from this admirable article. 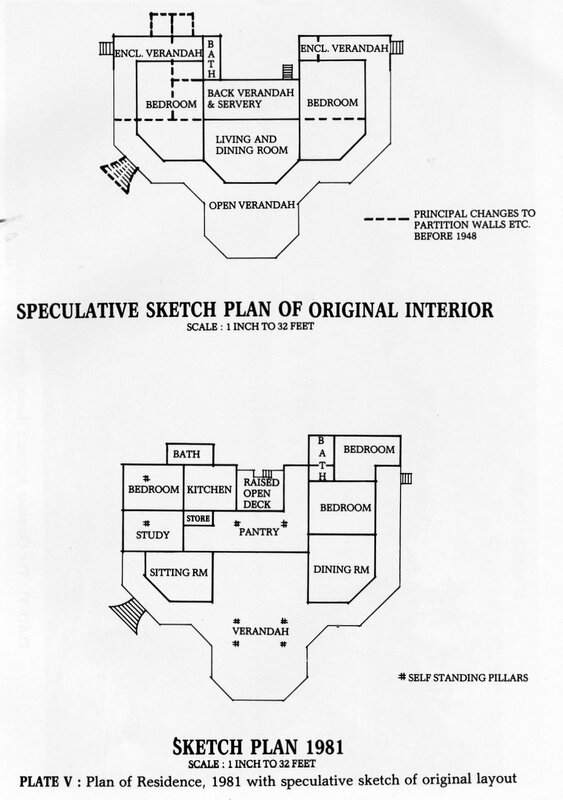 Supposed 1907 floorplan (above) and showing 1953 re-arrangement of veranda (below). The consular agent’s house, later used as consulate office, c.1898. The residency, with jetty and rebuilt offices, 1963. The House of Twelve Roofs, 1981. View from beside main veranda, 1981.